I remember very little of this film, having not seen it since it was first released, so much so that much of the stage play – recently revived for a tour which will shortly take up residency in the West End – felt brand new to me. Alan Bennett adapted his own play, The Madness of George III (the film had to be retitled for international audiences…) and Nicholas Hytner directed the film, as he directed the show at the National Theatre, and it fit quite neatly into my post-Christmas costume drama/Royalty film splurge. 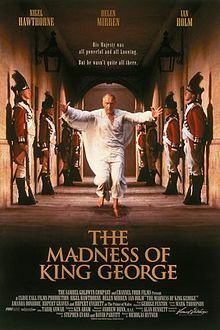 The story of how George III’s deteriorating mental health led to a constitutional crisis as his ambitious son made a play for power to try and force a Regency forms the backbone of the film as Nigel Hawthorne’s monarch is subjected to the vagaries of contemporary medical practice which had no understanding of mental illness and contained very little practice, instead being based on observations. It is only when a new course of action is recommended by non-medical man Dr Willis who utilises behaviour modification to try help regain equilibrium that progress is begin to be made, but the Prince of Wales and his political allies are moving fast to seize power. I was most impressed at how the film adaptation manages to shake off almost every hint of staginess and as a result, I believe you would be hard-pressed to tell it was originally a play. Hytner uses a great range of locations and composes some beautiful shots: the bustle of the wide-stretching retinue that accompanies the King and Queen everywhere create a constant human backdrop; the scene where the Royal Family are ascending the spiral staircase during one of his manic episodes is gorgeously lit and the costumes by Sue Honeybourne and Matthew Thompson are eye-catching and opulent. Indeed the men look mostly simply stunning in their outfits here, Anthony Calf in particular catching my eye. Hawthorne captures the irascibility of an autocratic monarch beautifully, layering his performance with a warm sensitivity towards his children and Mrs King (although I felt this relationship between husband and wife was stronger in the play) and a touching fraility that makes the manic scenes all the more affecting. Helen Mirren’s ever-faithful Queen Charlotte is superb, one really feels the desperation with which she tries to fight for her husband’s cause, backed by Amanda Donohoe’s excellent Lady Pembroke. Ian Holm makes a strong Dr Willis, Rupert Graves a kindly Greville and Rupert Everett (the least convincing fat man ever) and Julian Rhind-Tutt are fine as the feckless sons who would depose their father. Theatrical spots that pleased me were the aforementioned Anthony Calf as court professional Fitzroy, Adrian Scarborough as a youthful manservant, Julian Wadham’s excellent Pitt Jnr and cameos from Janine Duvitski and Selina Cadell. There’s also amusing spots from Alan Bennett himself and a young Michael Grandage, making it a thesp delight on all levels.